The Land Itself Under a Ban. 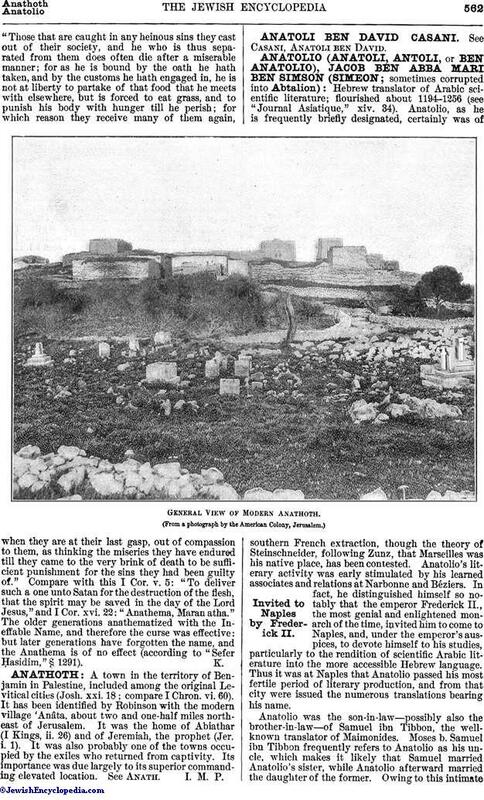 The Ḥerem in Postexilic Times. A Measure of Synagogal Discipline. A term used both in the sense of consecration and of condemnation. The old Greek 'Aνάθημα signifies a votive offering, something devoted to, or set aside for, the special use of the gods; in its ecclesiastical sense, specifically in a New Testament significance, "set aside for evil"—hence, cursed, excommunicated. The ecclesiastical use of the word "Anathema" in this particular sense presumably originated in Palestine in pre-Christian times (see Niddui). Only the postexilic forms of Anathema will be appropriately treated here. For a consideration of the Biblical forms, see Ban. The Old Testament Scriptures know nothing of an ecclesiastical Anathema or ban, unless the notice in Ezra, x. 8 be excepted, which may be the starting-point for a theory that the progressive spirit of Jewish legislation in the time of the great scribe condemned the barbarism of putting excluded persons to death. According to that passage, only the property of the condemned person was ḥercm, that is to say, given over to total destruction; but the culprit himself was simply excluded, that is to say, forbidden to communicate with the members of the congregation of the diaspora. This chapter of Ezra warrants an inference, substantiated by many other historical evidences, that the constitutional conditions of the government of the returned exiles differed radically from those of the old royal régime. With the disappearance of the Davidic dynasty the Jews become a theocratic, subsequently a hierocratic, congregation, the members of which are to conform to certain spiritual regulations designed to fortify the newly established commonwealth. Remarkably enough, Ezra believed the territory itself to be under a species of ban (niddah); and its restoration to the dignity of the patrimony of YHWH required that it be purged from the impurities with which it had become permeated through contact with the foreign inhabitants and their idolatrous practises (Ezra, ix. 1, 12). This declaration of the chronic impurity of the country itself gives the key to Ezra's twofold pronunciamento: politically, an excommunication of all foreigners who did not renounce their idolatry, and did not conform to the discipline of the religion of YHWH; spiritually, the introduction of a corrective measure to hold the Jewish tendencies toward paganism in check, and to further the growth of a pure monotheistic system unhindered by either the symbolism or the degrading practises of polytheistic religion. Ezra is the founder of the "congregation of Israel"—a community of worshipers of the one God—to the members of which, through the operation of a systematic discipline, idolatrous practises become abominable. This upbuilding of a spiritual fraternity required, doubtless, the inauguration of drastic measures, among which was the exclusion of all persons (men or women) tainted with paganism, or the closing of the territory to all persons who were not ready to subscribe unhesitatingly to the conditions imposed by the covenant of YHWH. Only in this way could the ban be removed from the land itself, which again became holy territory, the fit habitation for a holy and undefiled community (compare Ezra, ix. 2). Whether this "cutting off" of the Jewish members of the community, to prevent the growth of reprehensible practises, was already indicated in the Biblical form of ban, called karet ( ), can not now be determined (compare Winer, "B. R." ii. 14, s.v. "Lebensstrafen"). The Biblical form of the ḥerem changes, therefore, from the time of Ezra. In postexilic times it had been a grim, cruel measure of state, by which all persons falling under the ban were put to death and their property was destroyed. 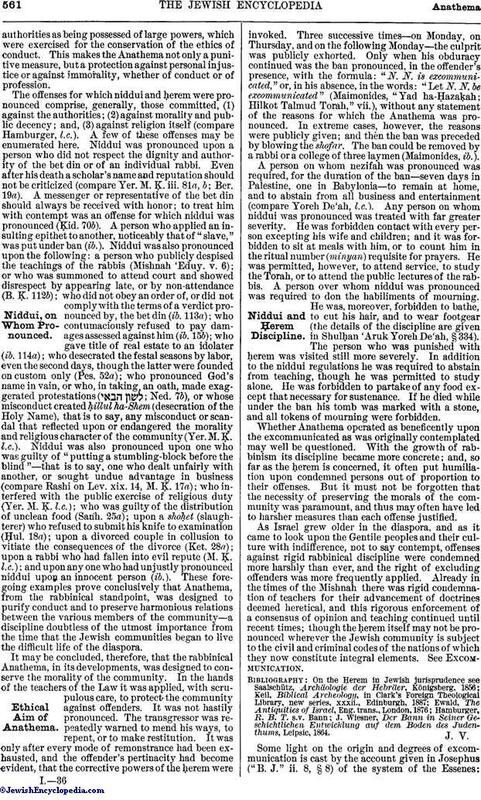 In the early centuries of the second Jewish commonwealth, founded upon theocratic lines, it becomes an expression of God's displeasure with all persons, Jew or pagan, who do not subordinate their personalconduct and tendencies to the discipline by which conduct, public and private, is henceforth to be regulated: it is an instrument of communal purification, a corrective measure designed to purge the community from all persons whose conduct, moral or political, is not in harmony with the constitution of the theocracy. But later on, specifically after the community is subdivided into congregational bodies, under the rule of their own officers, the ḥerem or Anathema is designed to control the moral deportment and obedience of their members; acting as a check upon insubordination, proclaiming or threatening expulsion from all advantages derived from an integral membership in the covenant of God; yet operating beneficently in its self-declared reversible character, under which the authorities might take cognizance of the transgressor's repentance and restore him to his former place in the congregation and community (Mishnah Ta'anit, iii. 8). The ḥerem, then, becomes in the hands of the authorities an instrument for the promotion of personal conduct as well as the enforcement of public morality, a constitutional power designed to operate beneficently upon the growth of a virtuous community. Whether this power at any time might not become a source of danger or be converted into an arbitrary exercise of authority was indeed a very serious question. The rise of the Jewish sects (see Essenes), the infusion of Hellenistic culture—which threatened to undermine Ezra's splendid work—the Maccabean revolt, and the subsequent unhappy political feuds which represent the struggle between theocrats (Pharisees) and hierocrats (Sadducees), or between the champions of a spiritual commonwealth and the votaries of a royalty not represented by the old dynasty —all these incidents helped, probably, to render the ḥerem an instrument of ecclesiastical discipline. While there exists no exact historical basis for this gradual development of the institution of Anathema, it may fairly be assumed that it was introduced at the same time as the rise of the Synagogue. Much, of course, depends on the period to which this rise is assigned. 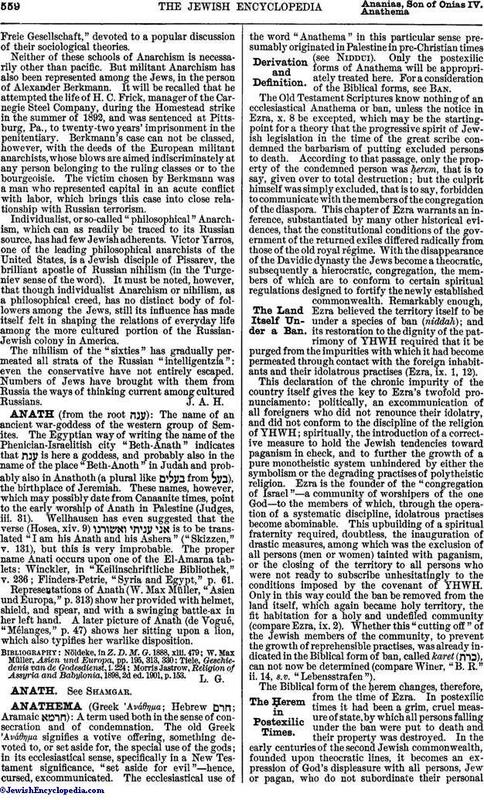 If, as Zunz implies, the rise of the Synagogue is contemporaneous with the Maccabean period (Zunz, "Gottesdienstliche Vorträge," p. 3, Berlin, 1832; compare also Schürer, "Gesch." English ed., ii. 54), it might be safely assumed that, in its main features, the Anathema of the first and later centuries of the present era resembles the ḥerem of earlier, specifically the pre-Maccabean, times, in its general tendency to fortify the foundations of the covenant by imposing penalties upon heresy as well as upon defections from the ethics of private life. Heresy, in particular, was the great offense during the dominancy of the sects. Ḥerem has already been defined. Niddui, , Aramaic Root: = Hebrew = , Isaiah lxvi. 5 in Pu'el form, to cut off, cast out, put under ban, anathematize; compare Buxtorf, "Lexicon Chaldaicum," under ; Levy, "Chaldäisches Wörterbuch," under ; Jastrow, "Dict." under ; Kohut, "'Aruch Completum," under (2). Nezifah, Aramaic nezifutha , Root: , to warn, to rebuke, hence to pronounce punishment or ban ( , one who has been excluded from the congregation; compare Shab. 115a; compare Levy, "Chaldäisches Wörterbuch," s.v. ). The Synagogue of old was conducted by officials to whom, among other things, was entrusted the enforcement of religious and ethical discipline, to the end that the community might not lose the character and identity of "a congregation of the Lord." Doubtless, one of the instruments by which this discipline was enforced was the ḥerem or Anathema. Of this three forms are known: Ḥerem, Niddui, and Nezifah or Nezifuta; the last named having been, in all probability, introduced only in the second century of the common era as a disciplinary measure against the growing disrespect in the popular attitude toward the rabbis (M. Ḳ. 16b-17a; compare Hamburger, "R. B. T." vol. ii., s.v. "Bann"). For the further term Shamta, properly Shammatta, Aramaic , the meaning is obscure. In all probability it represents a general designation for every form of ecclesiastical excommunication. Levy's derivation ("Chaldäisches Wörterbuch," under ) from , with assimilation of d and t, is acceptable. Elias Levita's assertion ("Tishbi," under ) that shammatta was the highest form of excommunication has often been declared groundless (compare, however, Winer, "Biblisches Realwörterb." i. 130, s.v. "Bann." For shammatta as a general form of Anathema, compare, for instance, M. Ḳ. 17a. Of the three forms or degrees known, niddui and nezifah were corrective in character, involving a temporary expulsion for a fixed period, at the expiration of which the culprit, upon exhibition of proper repentance, was restored to communication with the congregation and to his wonted privileges. The first degree, ḥerem, the Anathema proper, was an expulsion for an indefinite term and represented the final punishment of an offender who had been repeatedly warned and corrected. The person so expelled was muḥram (compare Anathema maran athain I Cor. xvi. 22. According to Graetz maranatha is a corrupt transcription of , "Thou art anathema"; compare Holtzmann, "Handkommentar zum Neuen Testament," pp. 173, 174, note). Doubtless, the catalogue of offenses for which these three degrees were applied was well defined (compare the classification in Shulḥan 'Aruk Yoreh De'ah, Niddui we-Ḥerem, § 334, 43). The modus operandi was to pronounce niddui upon an offender for the period of thirty days, when, having repented his conduct, the ban terminated. Persistence in the offense was punished with an extension of the ban for another thirty days, after which the sinner's contumacious conduct was finally punished with ḥerem, or excommunication, which, though indefinite, was revocable at the option of the authorities. The lesser ban, nezifah, was imposed for a period of seven days (ib. § 334, 2). In Babylonia there is an important modification—namely, that nezifah is imposed for one day only; niddui for seven days (compare M.Ḳ. 16a, 17b). The character of the offenses for which niddui and ḥerem were imposed permits a fair insight into the thorough discipline of rabbinical Judaism as it developed after the rise of the Synagogue, but more particularly after the destruction of the Temple and the dispersion of the Jews. Then the necessity for preserving Judaism became paramount. Thereupon was developed a rigid, uncompromising censorship of communal and domestic life, of public and private conduct, which, in its government of morals, became of the most far-reaching consequence. The doctrine of holiness was again urged as fundamental; and, next to obedience to God, implicit respect was to be shown to His law and to the authorities that had been appointed to administer it. While it does not appear that the Anathema was governed by fixed legal principles; while, in fact, the authorities could impose it without a determination of the verdict by unimpeachable testimony (ib. § 334, 43 gloss), this very latitude exhibits the spiritualauthorities as being possessed of large powers, which were exercised for the conservation of the ethics of conduct. This makes the Anathema not only a punitive measure, but a protection against personal injustice or against immorality, whether of conduct or of profession. The offenses for which niddui and ḥerem were pronounced comprise, generally, those committed, (1) against the authorities; (2) against morality and public decency; and, (3) against religion itself (compare Hamburger, l.c.). A few of these offenses may be enumerated here. Niddui was pronounced upon a person who did not respect the dignity and authority of the bet din or of an individual rabbi. Even after his death a scholar's name and reputation should not be criticized (compare Yer. M. Ḳ. iii. 81a, b; Ber. 19a). A messenger or representative of the bet din should always be received with honor; to treat him with contempt was an offense for which niddui was pronounced (Ḳid. 70b). A person who applied an insulting epithet to another, noticeably that of "slave," was put under ban (ib.). Niddui was also pronounced upon the following: a person who publicly despised the teachings of the rabbis (Mishnah 'Eduy. v. 6); or who was summoned to attend court and showed disrespect by appearing late, or by non-attendance (B. Ḳ. 112b); who did not obey an order of, or did not comply with the terms of a verdict pronounced by, the bet din (ib. 113a); who contumaciously refused to pay damages assessed against him (ib. 15b); who gave title of real estate to an idolater (ib. 114a); who desecrated the festal seasons by labor, even the second days, though the latter were founded on custom only (Pes. 52a); who pronounced God's name in vain, or who, in taking an oath, made exaggerated protestations ( ; Ned. 7b), or whose misconduct created ḥillul ha-Shem (desecration of the Holy Name), that is to say, any misconduct or scandal that reflected upon or endangered the morality and religious character of the community (Yer. M. Ḳ. l.c.). Niddui was also pronounced upon one who was guilty of "putting a stumbling-block before the blind"—that is to say, one who dealt unfairly with another, or sought undue advantage in business (compare Rashi on Lev. xix. 14, M. Ḳ. 17a); who interfered with the public exercise of religious duty (Yer. M. Ḳ. l.c. ); who was guilty of the distribution of unclean food (Sanh. 25a); upon a shoḥet (slaughterer) who refused to submit his knife to examination (Ḥul. 18a); upon a divorced couple in collusion to vitiate the consequences of the divorce (Ket. 28a); upon a rabbi who had fallen into evil repute (M. Ḳ. l.c. ); and upon any one who had unjustly pronounced niddui upon an innocent person (ib.). These foregoing examples prove conclusively that Anathema, from the rabbinical standpoint, was designed to purify conduct and to preserve harmonious relations between the various members of the community—a discipline doubtless of the utmost importance from the time that the Jewish communities began to live the difficult life of the diaspora. It may be concluded, therefore, that the rabbinical Anathema, in its developments, was designed to conserve the morality of the community. In the hands of the teachers of the Law it was applied, with scrupulous care, to protect the community against offenders. It was not hastily pronounced. The transgressor was repeatedly warned to mend his ways, to repent, or to make restitution. It was only after every mode of remonstrance had been exhausted, and the offender's pertinacity had become evident, that the corrective powers of the ḥerem were invoked. Three successive times—on Monday, on Thursday, and on the following Monday—the culprit was publicly exhorted. Only when his obduracy continued was the ban pronounced, in the offender's presence, with the formula: "N. N. is excommunicated," or, in his absence, in the words: "Let N. N. be excommunicated" (Maimonides, "Yad ha-Ḥazaḳah; Hilkot Talmud Torah," vii. ), without any statement of the reasons for which the Anathema was pronounced. In extreme cases, however, the reasons were publicly given; and then the ban was preceded by blowing the shofar. The ban could be removed by a rabbi or a college of three laymen (Maimonides, ib.). A person on whom nezifah was pronounced was required, for the duration of the ban—seven days in Palestine, one in Babylonia—to remain at home, and to abstain from all business and entertainment (compare Yoreh De'ah, l.c.). Any person on whom niddui was pronounced was treated with far greater severity. He was forbidden contact with every person excepting his wife and children; and it was forbidden to sit at meals with him, or to count him in the ritual number (minyan) requisite for prayers. He was permitted, however, to attend service, to study the Torah, or to attend the public lectures of the rabbis. A person over whom niddui was pronounced was required to don the habiliments of mourning. He was, moreover, forbidden to bathe, to cut his hair, and to wear footgear (the details of the discipline are given in Shulḥan 'Aruk Yoreh De'ah, § 334). The person who was punished with ḥerem was visited still more severely. In addition to the niddui regulations he was required to abstain from teaching, though he was permitted to study alone. He was forbidden to partake of any food except that necessary for sustenance. If he died while under the ban his tomb was marked with a stone, and all tokens of mourning were forbidden. Whether Anathema operated as beneficently upon the excommunicated as was originally contemplated may well be questioned. With the growth of rabbinism its discipline became more concrete; and, so far as the ḥerem is concerned, it often put humiliation upon condemned persons out of proportion to their offenses. But it must not be forgotten that the necessity of preserving the morals of the community was paramount, and thus may often have led to harsher measures than each offense justified. As Israel grew older in the diaspora, and as it came to look upon the Gentile peoples and their culture with indifference, not to say contempt, offenses against rigid rabbinical discipline were condemned more harshly than ever, and the right of excluding offenders was more frequently applied. 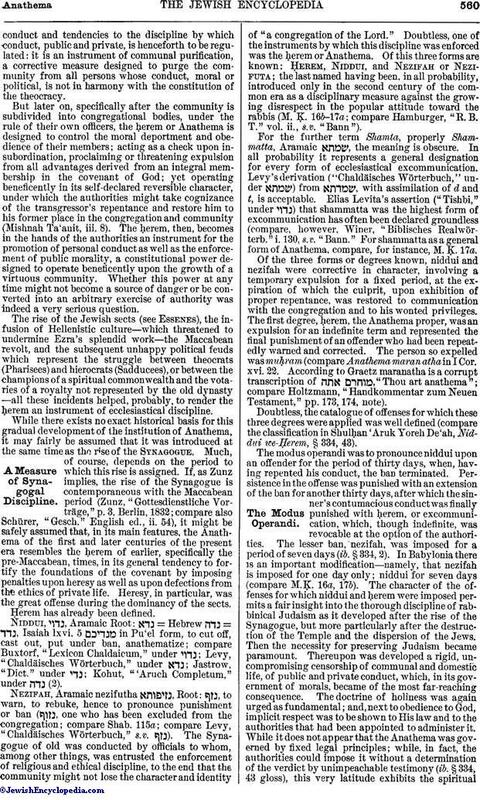 Already in the times of the Mishnah there was rigid condemnation of teachers for their advancement of doctrines deemed heretical, and this rigorous enforcement of a consensus of opinion and teaching continued until recent times; though the ḥerem itself may not be pronounced wherever the Jewish community is subject to the civil and criminal codes of the nations of which they now constitute integral elements. See Excommunication. J. Wiesner, Der Bann in Seiner Geschichtlichen Entwicklung auf dem Boden des Judenthums, Leipsic, 1864. Some light on the origin and degrees of excommunication is cast by the account given in Josephus ("B. J." ii. 8, § 8) of the system of the Essenes:"Those that are caught in any heinous sins they cast out of their society, and he who is thus separated from them does often die after a miserable manner; for as he is bound by the oath he hath taken, and by the customs he hath engaged in, he is not at liberty to partake of that food that he meets with elsewhere, but is forced to eat grass, and to punish his body with hunger till he perish; for which reason they receive many of them again, when they are at their last gasp, out of compassion to them, as thinking the miseries they have endured till they came to the very brink of death to be sufficient punishment for the sins they had been guilty of." Compare with this I Cor. v. 5: "To deliver such a one unto Satan for the destruction of the flesh, that the spirit may be saved in the day of the Lord Jesus," and I Cor. xvi. 22: "Anathema, Maran atha." The older generations anathematized with the Ineffable Name, and therefore the curse was effective: but later generations have forgotten the name, and the Anathema is of no effect (according to "Sefer Ḥasidim," § 1291).